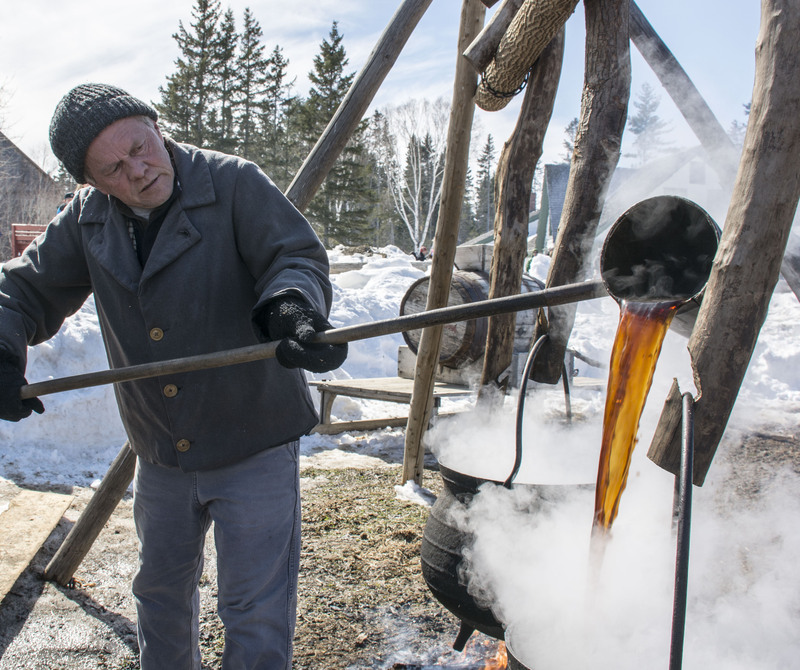 For Frederictonians, Kings Landing’s Sugar Bush has become the event that rings in spring. Since 1984, the museum has opened its doors in March to celebrate New Brunswick’s longstanding, delicious tradition of maple syrup making. Here’s your guide to join in the fun and make some memories of your own! You’ll have fun at Sugar Bush no matter the weather, but you’ve got to plan accordingly. A lot of the activities are outdoors, so if it’s cold: bundle up. If the snow is melting, be sure to dress the kids in splash pants and rubber boots. Scouts Canada will be setting up a modern winter campsite, and Kings Landing will have a 19th-century Sugar Bush encampment set up, so be sure your clothes don’t stop you from learning some winter survival skills! For $2, you can try maple candy on-the-snow. Instead of March Break, 19th-century kids had a school break for Sugar Bush. Rather than spending a week on bouncy castles, playing video games, and having their pals over, kids spent 5 to 6 weeks camping in the woods and harvesting sap with their families. This traditional candy was their reward. So bring a toonie, skip all the hard work, and enjoy this tasty treat! Sugar Bush is a staple spring tradition which means EVERYONE is showing up. Doors open at 8:30 a.m. for a delicious pancake breakfast and the museum opens at 9:00 a.m. Get there early and beat the line. If you do happen to see a line, don’t worry. The admission team knows how to handle a rush. They’ll get you through as quickly as possible and while you wait, you can enjoy some maple treats from The Peddler’s Market, a free Picaroons sample, and say hello to all the friends you’re bound to see. 4. Don’t forget your camera. Since Kings Landing is only open for these four days during the off-season, you won’t want to miss the opportunity to snap lots of pictures. Some scenes to look forward to are maple candy on the snow, cauldrons boiling over the fire, interpreters in 19th-century winter clothing, the Sawmill surrounded by snow-covered trees, and frost-covered branches. There will be so many picture-perfect moments that you may have to come more than once to capture it all! The map shows you important things like where you can pick-up and return snowshoes and where you can catch a sleigh ride or grab a bite to eat. All the details you’ll need to navigate your day are on the map, so don’t skip out on this step! If you can’t be bothered to carry a piece of paper around all day, at least snap a photo of the front and back of it. Who doesn’t love a good winter wagon ride? It’s the perfect photo op and a great way to get a unique view of Kings Landing. The wagons will operate from 10 a.m. until 4:30 p.m. with stops at the Welcome Centre and the King’s Head Inn. The rides are on a first-come, first-served basis, so don’t wait until you see a line to join the cue! The teamsters do their best to make sure everyone gets a turn, but it’s still a good idea to plan ahead. 7. Break from the pack. Yes, the programmed activities are awesome, but don’t feel tied to them! Kings Landing is a huge museum and Sugar Bush provides a unique opportunity to see it in a winter setting. Weather-permitting, rent a pair of snowshoes for free, and get off the beaten path. If we’re in the middle of a spring melt, wear your finest wellies and plan for a long walk to take in the beautiful scenery. As a word of caution, don’t venture onto the river. It may look frozen, but looks can be deceiving in March. If you purchase a 2019 season pass, you will get into Sugar Bush for free! Kings Landing pulls out all the stops for their summer programming. It truly is awesome! The village comes to life with farm animals, costumed characters, hands-on experiences and much more than we could possibly list. Each day during the regular season is unique, so you’ll want to visit often. As a bonus, you’ll be able to save 25% on admission to other New Brunswick attractions all year long. On March 9-10 and 16-17 from 9 a.m. to 4 p.m., experience Kings Landing’s 36th Annual Sugar Bush. The museum will have traditional encampments set up in their 19th-century landscape. See large cauldrons set up over open fires boiling sap down to maple syrup and savour a “long-lick” (a.k.a. maple candy in the snow) for $2 a stick. Wagon rides and snowshoeing will be available on a first-come, first-served basis. The King’s Head Inn, an 1850s style restaurant, will serve traditional dishes like venison stew, modern favourites like hot dogs and fries, as well as snacks, warm beverages, and Picaroons traditional ales. Get a cup of the Axe & Plough’s delicious coffee and a loaf of Mary’s Famous Brown Bread. The Inn will also have a variety of entertainment and activities for all ages. Enjoy a pancake breakfast each day from 8:30 a.m. to 2 p.m. Admission fees to the site are $12 per family, $7 per adult and $3.50 per child. Children under 5 get in for FREE. Maple candy on the snow costs $2 per stick. The pancake breakfast is $11 for a regular plate and $8 for a small plate at the door. For more information about this annual event and the season pass deal, visit www.kingslanding.nb.ca. Note: Deals offered by Kings Landing do not apply to the pancake breakfast during Sugar Bush.